What do you do, when you want to play in a band and there is only you? 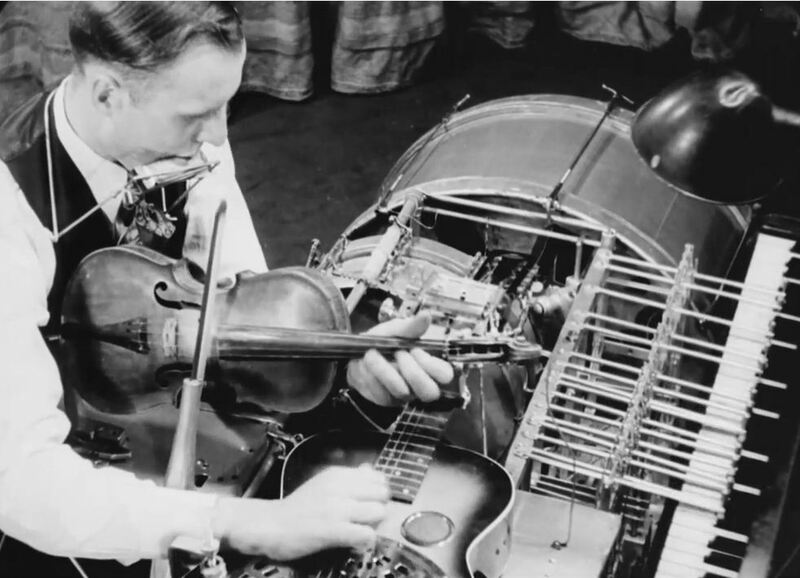 Self-taught musician and talented inventor Elmer Trudgen, born in Blenheim Ontario in 1912, gained fame as a one-man band during the late 1930s and pursued his hobby until the 1980s. His multi-piece musical instrument was created from a combination of sewing machine, auto & bicycle parts and custom fabricated devices. It allowed him to play 11 instruments at once: piano, violin, guitar, harmonica, bass drum, snare drum, triangle, wood blocks, cymbal, cow bell chimes and later banjo. The sewing machine was the catalyst of the idea, the treadle being used to draw the violin bow, played with the left-hand as he strummed the guitar with the left. The piano was played within a narrow range using long levers to depress the keys. Setup and tuning of the machine was extremely complex and playing required tremendous coordination requiring both feet, hands, elbows and mouth to render tunes such “She’ll Be Comin’ Round the Mountain”. Playing was also physically demanding and although at least one version of the machine still exists today, it is not something descendants of Elmer’s have chosen to try. Elmer gained fame during the 30’s after winning a New York City talent contest. He played at Faye’s Vaudeville Theatre and appeared on the radio Major Bowes Amateur Hour, a popular radio program based in New York. Although his career in U.S. was limited to a few months, Elmer continued to play at fall fairs and community events until 1980. Over that time he continued to refine his machine until it was able to play 17 instruments. Paul Trudgen, Elmer’s son still has two of the music-making machines, although in parts and in need of repair. Elmer’s story came to our attention when Paul and wife Jo Trudgen brought an aged, 45-RPM record to The Technology Centre, located in Owen Sound, for digitization. Converting to digital requires playing the original record (Analog) on a standard turntable, connected to an amplifier and fed into a computer. The converted audio track (Digital) is then enhanced to remove noise, boost volume and then burnt to CD or DVD or converted to an MP3 file for download. The original record was a self-made recording, using a record cutter designed for home use similar to the Wilcox-Gay Recordio produced in the 1940’s. It looks very much like an early portable record player with the addition of a microphone and input. Blank record disks were produced by numerous companies and allowed recording at 78 and 45 RPM. In this case, the poor quality of the existing record made it very difficult to retrieve a good digital copy. Professional recordings on a good source retain quality comparable to the original. See Elmer playing his machine.